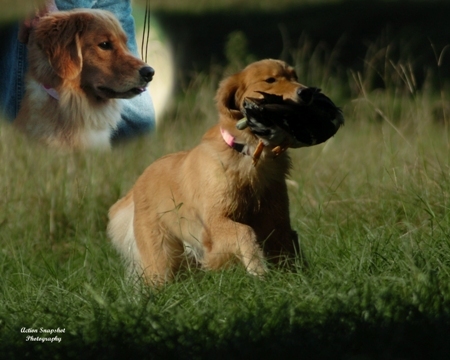 May came to us from Tammy Tomlinson of Hillock Golden Retrievers in February of 2005. May is our dynamite retriever and she’d rather be out chasing birds than doing just about anything else! May obtained her Junior Hunter title in the fall of 2007. May has produced beautifully for us and received the Outstanding Dam title.She is the Dam of Sky, Star, Goose, Bling, Dazzle, Martini and Lucy! She has never disappointed us and we are very thankful she was a part of our breeding program!